Korean cuisine refers to the traditional foods and preparation techniques of Korea. From the complex Korean royal court cuisine to regional specialties and modern fusion cuisine, their ingredients and preparation richly vary. Many dishes have become internationally popular. The foods described in this article differ dramatically from Korean royal court cuisine widely enjoyed Koreans today. For the Korean people, growing, harvesting, preparing, and eating food historically had been a social event. Living with a high population density in the Korean Peninsula throughout their history, Koreans have clustered in village communities outside their major cities. The communal lifestyle, heightened during the Joseon dynasty, made eating one of the most important times of day in the extended family farm home and the royal court. The vitality of Korean family and communal life reaches a climax during the meal time when Koreans enjoy a time together with their traditional foods. Although the variety and quality of food differed dramatically between for poor farmer and the royal court, the importance of Korean cuisine and meal time remained constant. Rice, noodles, vegetables, meats and tofu (dubu in Korean) make up the key ingredients in Korean cuisine. Traditional Korean meals boast abundant side dishes, (banchan), that accompany steam-cooked short-grain rice, soup, and kimchi (fermented, spicy vegetable banchan, most commonly cabbage, radish or cucumber). Banchan accompany every meal. Sesame oil, doenjang (fermented soybean paste), soy sauce, salt, garlic, ginger and gochujang (red chili paste) usually season Korean food. Before refrigeration, Koreans stored kimchi and other pickled vegetables preserved in big ceramic containers stored underground in outdoor courtyards during winter. That method continues in some rural areas of South Korea. Preparation of Korean food requires intensive labor although many Koreans living in urban areas purchase prepared traditional food in supermarkets or outdoor markets. Korean royal cuisine, once only enjoyed by the royal court of the Joseon period, takes from a few hours to several days to prepare. The chief harmonizes warm and cold, hot and mild, rough and soft, solid and liquid, and balances colors. Served on hand-forged bronzeware or bangjjaa, the specific arrangement of small dishes alternates to highlight the shape and color of the ingredients. Restaurants that serve traditional royal cuisine can be found in select locations within the city of Seoul, charging as much as ₩240,000 (~US$265) per person. Imperial cuisine has received a recent boost in popularity due to Dae Jang Geum, a widely popular Korean television drama about a humble girl becoming the royal head chef during the Joseon period. Koreans traditionally sat on cushions at low tables with their legs crossed in a modified lotus position, although most urban Koreans normally east Western style at tables. Some traditional restaurants provide floorchairs with backs. A silver or stainless steel chopsticks (jeotgarak) and a long-handled shallow spoon (sutgarak) usually accompany meals. 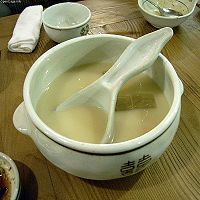 Sutgarak bare closer resemblance to the Western spoon than the Chinese soup spoon. The jeotgarak and sutgarak set make a sujeo (a contraction of sutgarak and jeotgarak) set, although sujeo can also mean a sutgarak. Unlike other chopstick cultures, Koreans have used spoons since at least the fifth century. Unlike the Chinese and Japanese, Koreans generally leave their rice or soup bowls on the table, eating from them with spoons. Koreans eat banchan with chopsticks. Hot soup for each person in a larger bowl wider than its height (to the right of the rice). Sometimes people share jjigae or other liquid foods from a large pot in the center of the table. A set of silver (traditional) or stainless steel spoon for rice and soup, and chopsticks for banchan (to the right of the soup). Various small bowls of shared bite-sized banchan side dishes. Drinks may or may not be served while eating. Families usually drink chilled or iced water with meals. In restaurants, waiters usually serve water or tea, usually a grain tea such as barley tea rather than actual tea. Alcohol often accompanies a traditional Korean meal. After the meal, patrons might drink a sweet refresher like soojunggwa or shikye. The type of drink might vary with the season. 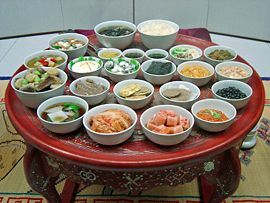 Although custom allows freedom to determine the order to eat foods on the table, customarily the Koreans eats from their individual rice or soup bowl while sharing banchan (side dishes). According to Korean tradition, elders, superiors, and guests have the privilege of eating first. Commonly, elders, superiors, and guests receive the best food dishes. Etiquette requires that the bowls stay on the table, people using the sutgarak (spoon) and jeotggarak (chopsticks) to eat. Although normally considered uncouth, picking up the bowls may be socially acceptable in casual settings. During the Joseon dynasty the yangban class had the privilege of eating from lacquered tables as opposed to peasants who at meals in the field. Declining food or drink offered by an elder. Picking up chopsticks or a spoon and eating before the oldest person at the table does. Sticking the chopsticks or spoon straight up in the bowl, as it's reminiscent of incense burned during a funeral. Stabbing food with chopsticks and picking up food with hands, with the exception of finger foods. Using a spoon and chopsticks at the same time. Using chopsticks or a spoon with a left hand; most elder citizens frown at left-handedness. Making unnecessarily noisy sounds when chewing foods or clanking a bowl with a spoon or chopsticks. Stirring rice or soup with a spoon or chopsticks. Stirring shared side dishes to select what you want to eat. Removing certain spices or ingredients from shared side dishes. Carelessly coughing and sneezing at the same table. Finishing eating much faster or slower than the others at the same table, forcing them to hurry or wait. Using toothpicks with the mouth open and leaving them on the table. Drinking while looking straight at an elder. Turn away slightly to the side while tilting your head. Accepting a drink from an elder or superior with both hands on the cup. Instead, the Korean places the left hand on the heart while the right hand holds the cup into which the liquor will be poured. Because the answer "Mm" means "yes," you may answer a question with a closed mouth while eating. Replying with one's mouth open or with food showing displays poor table etiquette, although you may slurp soup if server boiling hot. Older people, and higher ranked people by profession or social status, may ignore custom while other people at the table have to follow the rules. As mentioned earlier, Koreans understand that international visitors lack knowledge of Korean customs. Though diners may leave shared food unfinished, custom requires finishing one's individual portion of rice. Eating too quickly will imply that the host provided insufficient food. At restaurants, Koreans tend to have one person pay for the entire meal although among young people paying "Dutch" by dividing up the bill has become popular. Custom permits asking for refills of banchan dishes. In informal situations, Koreans usually allow latitude with those customs. During family dinners, many parents enforce the customs for the benefit of the children, to teach proper table manners and etiquette. Families enforce the rules less frequently as children become older, having fully learned proper table manners and behavior. Much of Korean cuisine consists of simple dishes known for its strong, pungent flavors and odors. Many Korean banchan rely on fermentation for flavor and preservation, resulting in a tangy, salty, and spicy taste. Some dishes (for example, the city of Jeonju with Bibimbap) associate especially with certain regions, either as the place of origin or regional variety of the food. Restaurants often use those famous names on their signs or menus (i.e., "Suwon galbi"). Romanization of Korean words may vary widely, with g/k (e.g., galbi/kalbi), j/ch, d/t and b/p often used interchangeably. At traditional restaurants, waiters cook meats at the center of the table over a charcoal grill while the set banchan and individual rice bowls in front of each patron. Diners place the cooked meat, cut into small pieces, in fresh open lettuce leaves along with rice, thin slices of garlic, ssamjang (mixture of gochujang and dwenjang), and other seasonings. 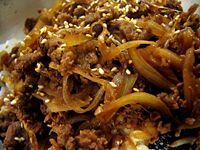 Bulgogi (불고기): thinly sliced or shredded beef marinated in soy sauce, sesame oil, garlic, sugar, green onions and black pepper, cooked on a grill (sometimes at the table). Bulgogi literally means "fire meat." Variations include pork (Dweji bulgogi), chicken (Dak bulgogi), or squid (Ojingeo bulgogi). 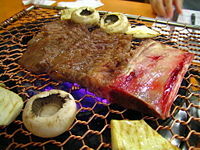 Galbi (갈비): pork or beef ribs, cooked on a metal plate over charcoal in the center of the table. Sliced thicker than bulgogi, visitors often call galbi "Korean BBQ." Served seasoned or unseasoned. A variation using seasoned chicken is called (Dakgalbi). Jokbal (족발): pig's feet served with a red salted shrimp sauce. Samgyeopsal (삼겹살): Unseasoned pork bacon cut from the belly, served in the same fashion as galbi. Sometimes cooked on a grill with kimchee troughs at either side. Commonly grilled with garlic and onions, dipped in ssamjjang and wrapped in lettuce leaves. Hoe(Pronounced 'hweh') \hö\ (회): raw seafood dish dipped in gochujang or soy sauce with wasabi (hot radish paste), served with lettuce or sesame leaves. Sannakji (산낙지) or live octopus, served live and still moving on the plate. Makchang (막창): grilled pork large intestines prepared like samgyeopsal and galbi. Often served with a light doenjang sauce and chopped green onions. Popular in Daegu and the surrounding Gyeongsang region. Gujeolpan (구절판): literally "nine-sectioned plate," an elaborate dish consisting of a variety of vegetables and meats served with thin pancakes. Served only at special occasions such as weddings, associated with royalty. Sinseollo (신선로): An elaborate dish of meat and vegetables cooked in a rich broth. Served in a large silver vessel with a hole in the center, burning embers placed to keep the dish hot throughout the meal. Doenjang jjigae (된장찌개): or soybean paste soup, typically served as the main course or served alongside a meat course. Contains a variety of vegetables, shellfish, tofu, and occasionally small mussels, shrimp and/or large anchovies. Anchovies normally used for preparing base stock before adding main materials. Gamjatang (감자탕, "pork spine stew"): a spicy soup with pork spine, vegetables (especially potatoes) and hot peppers with the vertebrae separated. Often eaten as a late night snack but also served for a lunch or dinner. Haejangguk (해장국): a favorite hangover cure consisting usually of meaty pork spine, dried cabbage, coagulated ox blood (similar to blood pudding), and vegetables in a hearty beef broth. Legend states that soon after World War II, the restaurant that invented the stew represented the only place open in the Jongno district when the curfew lifted at 4 A.M.
Jeongol (전골) : a traditional spicy Korean stew, consisting of various types of seafood and vegetables, generally served on a burner. Kimchi jjigae (김치찌개): A soup made with mainly Kimchi, pork, and tofu. Common lunch meal or complement to a meat course, normally in a stone pot, still boiling when served. Maeuntang (매운탕): a refreshing, hot & spicy fish soup. Samgyetang (삼계탕): a soup made with Cornish Game Hens stuffed with ginseng, a hedysarum, sweet rice, jujubes, garlic, and chestnuts. Traditionally eaten during the summer. Seolleongtang (설렁탕): ox leg bone soup simmered for more than ten hours until milky-white. Usually served in a bowl containing glass noodles and pieces of beef. Served with sliced Green onion and black pepper as condiments. 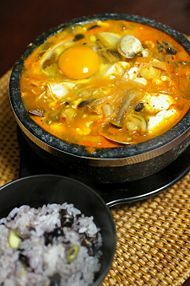 Sundubu jjigae (순두부 찌개): a thick spicy stew made with soft tofu. Traditionally, the diner puts a raw egg in it while it's still boiling. Budae jjigae (부대찌개, "army squad stew"): Soon after the Korean War, with meat scarce in Seoul, some people made use of surplus foods from U.S. Army bases such as hot dogs and canned ham (such as Spam), incorporating it into a traditional spicy soup creating budae jjigae. Still popular in South Korea, the dish now often incorporates ingredients such as instant ramen noodles. Bibimbap (비빔밥, "mixed rice"): Rice topped with vegetables, beef and egg, and served with a dollop of chili pepper paste. A variation of this dish, dolsot bibimbap (돌솥 비빔밥), comes n a heated stone bowl, a raw egg cooked against the sides of the bowl. Yukhoe (육회), a popular version, consists of raw beef strips with raw egg, a dash of soy sauce mixed with Asian pear and gochujang stirred together in one large bowl and eaten with a spoon. Hoedeopbap \hweh-dup-bahp\ (회덮밥): Rice topped with cubed raw fish, fresh vegetables and chogochujang. Kimchi (김치): Vegetables (usually cabbage, white radish, or cucumber) commonly fermented in a brine of ginger, garlic, green onion and chili pepper. With seemingly endless varieties, kimchi comes as a side dish or cooked into soups and rice dishes. Koreans traditionally make enough kimchi to last for the entire winter season, although with refrigerators and commercial bottled kimchi that practice has become less common. 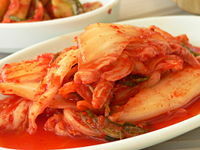 Kimchi has been cited for its health benefits and has been included in Health magazine's "World's Healthiest Foods". Some research has found nitrate and salt levels in Kimchi responsible for gastric cancer, although shellfish and fruit consumption have been found to act as protective agents against gastric cancer. Paradoxically, research has also found kimchi a preventive factor to stomach cancer. Kongnamul (콩나물): Soybean sprouts, usually eaten in boiled and seasoned banchan. Soybean sprouts also serve as the main ingredient in kongnamul-bap (sprouts over rice), kongnamul-guk (sprout soup), and kongnamul-gukbap (rice in sprout soup). Naengmyeon (냉면, (North Korea: 랭면, Raengmyŏn), "cold noodles"): A summer dish that consists of several varieties of thin, hand-made buckwheat noodles, served in a large bowl with a tangy iced broth, raw julienned vegetables and fruit, and often a boiled egg and cold cooked beef. Also known as Mul ("water") Naengmyeon, to distinguish Bibim Naengmyeon, which has no broth mixes with gochujang. Japchae (잡채): Boiled dangmyeon or potato noodles, steamed spinach, roasted julienned beef, roasted sliced onion, roasted julienned carrots mixed with seasoning made of soy sauce, sesame oil and half-refined sugar. Jajangmyeon (자장면): A variation on a Chinese extremely popular noodle dish in Korea, made with a black bean sauce, usually with some sort of meat and a variety of vegetables including zucchini and potatoes. Usually ordered and delivered, like pizza. Ramyeon (라면): Spicy variation of Japanese Ramen, usually cooked with vegetables and meats. Snacks play an important social role in Korean culture. In Korea, snack food may be purchased from street carts during the day, where customers may eat standing beside the cart or have their food wrapped up to take home. At night, many streets fill with small tents that sell inexpensive foods, drinks, and alcoholic beverages. Most Korean people consider the food as snacks rather than a complete meal. Seasonal snacks include Patbingsu a refreshing iced treat eaten in the summer, and warm soup, gimbap, hotteok, and Bungeoppang, enjoyed in the fall and winter. Gimbap (literally, seaweed-rice, 김밥) a popular snack in Korea, consists of cooked rice, sesame oil, salt, and sesame seeds, vinegar and sugar added as seasonings wrapped in a sheet of dried laver. The seasoned rice spread on the laver, then fried egg, julienned carrots, julienned ham, seasoned ground beef or seasoned fish cakes, pickled radish, seasoned spinach, and seasoned gobo and cucumber packed on the rice, and rolled in the manner similar to that of the Japanese sushi. Varieties of gimbap include tuna, cheese, bulgogi, vegetable. Fermented kimchi (kimchijeon) or seafood (haemul pajeon), mixed into a flour-based batter and fried in an oiled pan. Dipping in a mixture of soy sauce, vinegar, and red pepper powder popular. 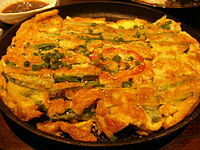 Pajeon (파전): pancake made mostly with eggs, flour, green onion, and oysters or fresh baby clams cooked on frying pans. Bindaetteok (빈대떡): pancake made of ground mung beans, green onions, and kimchi or peppers cooked on frying pans. Soondae (순대): Korean sausage made with a mixture of boiled sweet rice, oxen or pig's blood, potato noodle, mung bean sprouts, green onion and garlic stuffed in a natural casing. Ho-tteok (호떡): Similar to pancakes, except the syrup serves as a filling rather than a condiment. Melted brown sugar, honey, chopped peanuts and cinnamon commonly used fillings with vegetables sometimes added to the batter. Hotteok, usually eaten during the winter months, warms the body with the sweet and warm syrup in the pancake. Anju (안주), a general term for a Korean side dish consumed with alcohol (often with Korean soju). Commonly served at bars, Noraebang (karaoke) establishments, and restaurants that serve alcohol. Customers order anju as appetizers or even a main dish. Some examples of anju include steamed squid with gochujang, assorted fruit, dubu kimchi (tofu with kimchi), peanuts, odeng/ohmuk, gimbap (small or large), samgagimbap (triangle-shaped gimbap like the Japanese onigiri), sora (소라 (a kind of shellfish popular in street food tents), and nakji (small octopus, as eaten on screen in the movie Oldboy). Soondae represents a kind of anju similar to samgyeopsal or dwejigalbi. Most Korean foods may be served as anju, depending on availability and the diner's taste. Koreans consider anju different from the banchan side dishes served with a regular Korean meal. Tteok (떡): A chewy cake made from either pounded short-grained rice (메떡, metteok), pounded glutinous rice (찰떡, chaltteok), or glutinous rice left whole, without pounding (약식, yaksik). Served either cold (filled or covered with sweetened mung bean paste, red-bean paste, raisins, a sweetened filling made with sesame seeds, mashed red beans, sweet pumpkin, beans, dates, pinenuts and/or honey), usually served as dessert or snack. Sometimes cooked with thinly-sliced beef, onions, oyster mushrooms, etc. served as a light meal. Songpyeon (송편): Chewy stuffed tteok (rice cake) served at Chuseok (Mid-Autumn Festival) (also known as the "Korean Thanksgiving") decorated with pine needle. Honey or another soft sweet material, or red bean found inside. Yakshik (약식): a dessert made with sweet rice, chestnut, pine nut, jujube and raw sugar. OB lager beer: Adds rice to the grain base, also available as a dry beer. Taedonggang (대동강): A North Korean beer now sold bottled in some bars in South Korea. Microbrewery beers and bars growing in popularity. Soju: A clear spirit originally made from grain, now also made from sweet potatoes. Koreans consider soju made from grain superior (as with grain vs. potato vodka). Soju, with around 22 percent ABV, represents a favorite beverage of college students, hard-drinking businessmen, and blue-collar workers. Yakju: A refined pure liquor fermented from rice, with the best known being cheongju. Takju, a thick unrefined liquor made with grains, with the best known being makkoli (막걸리), a white, milky rice wine traditionally drunk by farmers. Korean wines generally divide into fruit wines and herbal wines. Acacia, maesil plum, Chinese quince, cherry, pine fruits, and pomegranate number among the most popular. Koreans enjoy Majuang wine (a blended wine of Korean grapes with French or American wines) and ginseng-based wines also. Juansang: Alcoholic drinks (ju) and accompanying side dishes (an) set together on the table. The dishes vary depending on the kinds of liquor or wine. Gyojasang: A large table prepared for banquets. Alcohol beverages and a large variety of side dishes, rice cakes, confectioneries, and fruit punch placed together on the table. After finishing the liquor, waiters serve noodle soup. Fusion food also rapidly becoming popular. Many Chinese, northern Italian, French, and Indian fusion restaurants are found throughout South Korea. Vegetarian restaurants, sidelined with the decline of Buddhism and advance of missionary Christianity, have had a small resurgence, found in most cities. Korean restaurants abound in areas with large Korean populations. Common examples include Koreatowns situated in other countries. Restaurants run by the North Korean government have opened in China. Although controversial, some restaurants specialize in serving dog meat. South Koreans consume approximately two million dogs annually. According to a 2006 survey conducted by The Office For Government Policy Coordination (국무조정실), 55.3 percent of South Koreans have eaten dog meat at least once. Dog meat, most commonly eaten in the summer as bosintang (spicy dog stew) by older men in rural restaurants, has the reputation of enhancing virility and physical stamina during hot summer days as well as other supposed "medicinal" benefits. 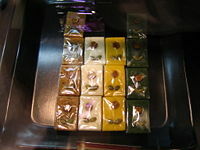 Korean companies also manufacture a medicinal extract called gaeju (개주) or gaesoju (개소주),photo, made from dog meat as well as various herbs and other ingredients (but which, despite its name, contains no alcohol). Although against the law, the sale of dog meat takes place openly. Korean breeders raise a mixed breed of dog called nureongi (누렁이) specifically for slaughter and consumption. ↑ Joan Raymond. World's Healthiest Foods: Kimchi (Korea) Health Magazine.Retrieved May 13, 2008. ↑ . Tour2korea.com. Kimchi. accessdate 2007-01-30. ↑ Kimchi and soybean pastes are risk factors of gastric cancer . ↑ Bum-Jun Suh. "Dogs adored while being eaten in Seoul" . The Seoul Times. Retrieved May 13, 2008. ↑ FIFA barks at Korean 'animal cruelty', November 6, 2001 . CNN World. Retrieved May 13, 2008. ↑ Jane Cooper, "Mixed fate for Korea's mutts in Year of Dog," The Korea Herald January 31, 2006. ↑ "South Korea's dog day" 17 August, 1999, UK BBC News. Retrieved May 13, 2008.